Baugh's Blog: Book Review: Charles Dickens 7 - "Martin Chuzzlewit"
Book Review: Charles Dickens 7 - "Martin Chuzzlewit"
By the time that Charles Dickens had completed his fifth novel, Barnaby Rudge, he had been writing almost non-stop for five years, in order to meet the monthly, or weekly, deadlines for the novels’ serialisations (there was a six month gap between the completion of Nicholas Nickleby and the beginning of The Old Curiosity Shop). And for two stretches of about a year each, he was writing two novels simultaneously. The pressure was intense; and he just could not keep up that volume of work any longer, as the obligations of a public career and the duties of family life grew more demanding. So it comes as no surprise that in July, 1840 Dickens decided that it was time he took a sabbatical from serialized novel-writing. For fifteen months he had been editing - and writing in its entirety – a weekly magazine called Master Humphrey’s Clock. His original idea had been to write a compendium of short stories and articles of topical interest. After a stupendous start, sales of the weekly rapidly plummeted. 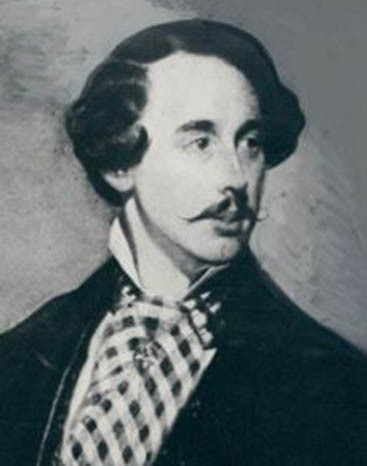 Readers wanted Dickens the novelist, not Dickens the journalist and yarn-spinner. To revive the magazine’s flagging circulation, he began to serialise The Old Curiosity Shop. And at the conclusion of that phenomenal success, he began immediately into Barnaby Rudge. But he had had enough of the tremendous strain it took being writer/editor of a weekly magazine and, at the same time, the author of very long novels. So it was that in July, 1840 he decided that once Barnaby Rudge was finished he would close up the magazine and take a rest from writing. His confidence had been rather shaken at times when his periodical did not always sell as he expected. He thought that the public might be getting tired of his work. 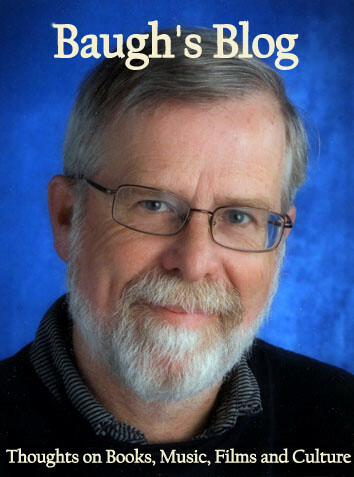 His plan was to take a year off and then come back refreshed and give his devoted readers another blockbuster novel. He met with his publishers, Chapman and Hall, and proposed that they finance a year’s sabbatical. This was a presumptuous move, since Dickens already owed them £3,000 from when they bought up Dickens’s copyrights and contracts from his former-publisher Richard Bentley. But, as we’ve seen before, Dickens was very sure of himself and the long-term value his name had for his publishers. He persuaded Chapman and Hall to advance him another £1,800 to finance a year of idleness. Nice work if you can get it! At the same time, Dickens had been seriously toying with the idea of making a visit to the United States of America. He knew he had many admirers amongst the literati there and his bootlegged novels were a tremendous success. He thought he might write a series of essays for magazines, or write a travel book about the country. And when he got a letter from American writer Washington Irving urging him to come over to the new world - telling him that he would be “a triumph from one end of the States to the other”, he became obsessed with the idea of going. It took a while to convince his wife Catherine to buy into the idea – they had four children under the age of five, after all. But by September, his mind was made up. Go they would. 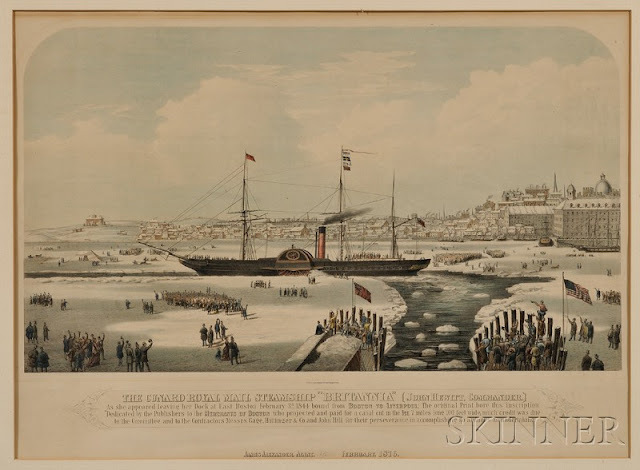 They left for America from Liverpool aboard the steamship Britannia on January 2, 1842. It was a very rough crossing. They arrived in Halifax, Nova Scotia, on January 20. 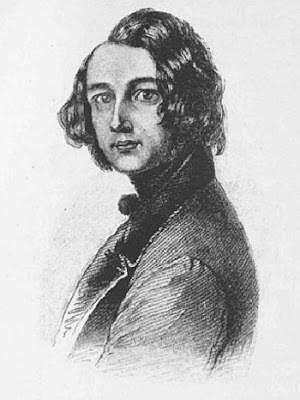 Describing his first foray into the crowds of North American admirers, Charles Dickens refers to himself for the very first time with the nickname “the inimitable”. Two days later their boat sailed into Boston Harbour. He was intrigued and exhilarated by his new surroundings. He was taken to meet people at the Tremont House Hotel and, when he entered the lobby, he greeted a group of curious strangers with the old pantomime phrase “Here we are!” The whirlwind of events, dinners, meetings, and speeches was exciting at first. But he soon became tired of the constant attention from the pressing crowds. And many of the newspapers began to turn against him after he started to criticise regularly in his speeches the American practice of printing pirated editions of his novels. There should be international copyright laws, he argued, to protect authors like himself from being exploited by unscrupulous publishers. ﻿And Dickens’s attitude towards American society and culture began to change. Everywhere he looked, he sensed an obsession with business and money. He disliked the people’s coarseness of manner – the constant spitting in public places, for example. He found Americans lacking in humour, self-righteous, insecure, and constantly in need of praise. He witnessed the effects of fame on his everyday life – the lack of privacy and the tyranny of public opinion. And he thought the press was truly dreadful, distorted by extreme political views of all sorts. Despite meeting some interesting people – artists, writers and public figures – who would become friends and future correspondents of his, the overall experience left him with considerable contempt for this new world. 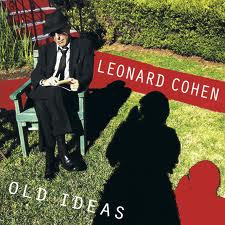 He emerged a changed man – one with a new and deeper understanding of who he was as an individual and as an Englishman. It was to have both an immediate and a long-lasting impact on his writing. And would come to feature in his next novel, Martin Chuzzlewit. ﻿As he was writing American Notes, Dickens began thinking about a new novel. He wanted to return to a contemporary, topical issue, after trying his hand for the first time at a Walter Scott-styled historical novel with Barnaby Rudge. So he went down with friends to Cornwall, in the south-west of England, to visit a small tin mine. He was thinking of turning his critical attention to mines and mine-owners in his new book. But it all came to nothing. He then took quite a while pondering a subject and looking for a theme. Dickens began to plot his new novel in early November. He was now regularly attending services at a Unitarian church in Little Portland Street in London. His commitment to Christianity was focused not on theology, not on doctrine, but on the moral and social obligations he found in the Christian message. He was probably looking for a moral theme that he could use in a story of social satire - and some topical characters and settings. Eventually he hit upon the figure of Seth Pecksniff – an embodiment of selfishness and hypocrisy. He and his two daughters are located in a small village near Salisbury, Wiltshire. Architecture, and architects, had been much in the news, recently – and not always for the right reasons. So Dickens made Pecksniff an architect – one of dubious skill and little apparent experience. His real specialty in life was to take on inexperienced apprentices and charge them a handsome annual fee to board in his family home and to receive the benefit of his “professional” instruction. The first few chapters of Martin Chuzzlewit were quickly written, but Dickens was being uncharacteristically careful in the novel’s planning. He seemed to be putting more thought into the working out of the plot. He wasn’t going to rely on the familiar, picaresque structure that would allow him to improvise at will, as he went along. There was a lot of foreshadowing – later events being anticipated in earlier chapters. He had an overarching theme and, unusual for him, he planned to show moral development in several key characters. Unfortunately, it was also one of his least popular. The early instalments sold poorly, only about 20,000 copies each (compare that with the 100,000 copies sold each month towards the end of The Old Curiosity Shop). Revenue from advertising dropped dramatically – these monthly publications, like modern magazines, included many pages of advertisements. His publishers, Chapman and Hall, were so dismayed by the relative failure of the book that they invoked a penalty clause in their contract with Dickens. They required him to pay back the money they had lent him, in order to cover their costs. Dickens was incensed, and the situation led to a breach in his relationship with them. 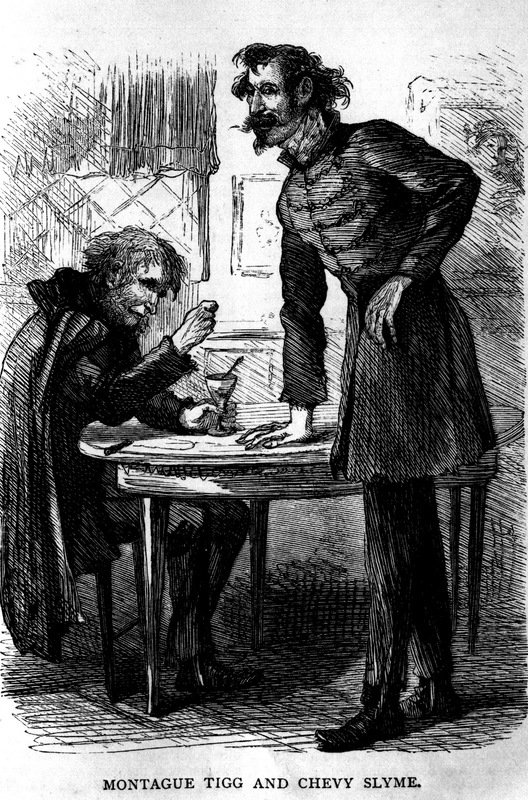 To revive interest in the novel amongst his readers, he decided to add into his plot a brand new element – he sent the young Martin Chuzzlewit and his man-servant Mark Tapley on a speculative, and ultimately doomed, trip to America, in order to seek their fortunes and escape their failed prospects in England. Dickens decided to use this opportunity to vent his spleen on America and Americans – to focus almost exclusively on the negative aspects of the place. It turned out to provide brilliant comic interludes in the book, but in doing so, it really ruptures the unity of tone and purpose he had already established. As I was reading through these American adventures, I began to find them rather tedious and tendentious and wanted Dickens to get his story back to England. And his American readers, of course, were infuriated by the vitriol Dickens employs throughout this disastrous venture into the new world. And, ironically, the stratagem did not work – the episodes in the U.S. only helped increase sales by a few thousand each month. ﻿ ﻿﻿Martin Chuzzlewit, in some ways, is the story of an extended family – and how the figure of Seth Pecksniff serves as a catalyst in the working out of their destinies. It is a novel all about money – the misery it brings into people’s lives: the need to borrow, the political uses of lending, the machinations and jockeying for inheritances, and the fall-out from failed investments. This focus on money reflects Dickens’s own concerns of the moment – the increasing financial demands made upon him by his extended family, and the large debt he owed now to Chapman and Hall. But this obsession with money is subsumed under the larger theme of selfishness. “Self! Self! Self!” several characters apostrophise at different moments in the story. As usual, Dickens’s story is full of interesting characters. There is Tom Pinch, the put-upon man-servant of Seth Pecksniff, who embodies a sort of feckless, well-meaning, but gullible innocence. He reminds us of Newmann Noggs, the put-upon servant of the malevolent Ralph Nickleby. They both suffer much. But Pinch is in a more extreme case of weakness, because – unlike Noggs – he has a total admiration for his employer and doesn’t see that this ‘benefactor’ is a pious fraud. He represents a Christian ideal and, despite the innocence, stands strong for goodness and loyalty. Another familiar Dickens-type is found in this novel – the lovable and enterprising young scalliwag with the silver tongue. Here it is Bailey Junior, who starts out in the story as boots at Mrs. Todger’s London boarding house, and moves on to work for the rogue Tigg Montague. This ambitious young lad reminds us of the Artful Dodger in Oliver Twist and Kit Nubbles from The Old Curiosity Shop, who works in the service of Mr. Garland. He is on-the-make, but very honest. He’s a smooth talker, but he sticks to the truth. And then there’s the astonishing Montague Tigg – who begins the story as the hanger-on pal of the Chuzzlewit-relative Mr. Chevy Slyme, but later serves as corrupt Chairman of a Ponzi-scheme enterprise known as the Anglo-Bengalee Assurance Company. He’s a loathsome delight, because he swindles in turn some of the most degenerate figures in this world full of hypocrisy and greed. Another smooth talker. 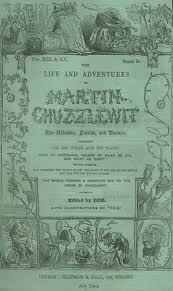 Martin Chuzzlewit is one of Dickens’s best books. Apart from the American episode, it flows wonderfully, and lacks the aimlessness of much of his earlier work. It is sometimes called the last of his picaresque novels; but, really, it marks a break from that technique. It doesn’t rely as much on interesting incident, and adventures-on-the-road; it is more deliberately structured than that. And the heart of the story is not what comes next, but the revelation of the multifarious effects of lives centred on selfishness and the grasping after money. It is ultimately a moral enterprise. Martin Chuzzlewit is a funny book. 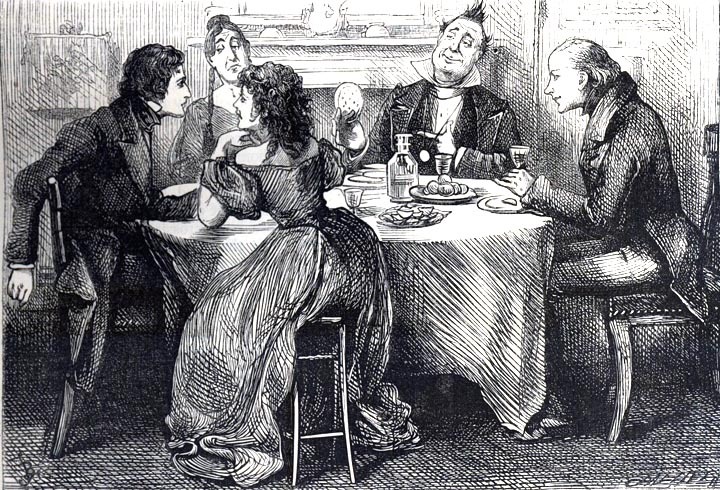 In many ways, it is one of Dickens's very best comic masterpieces, because of the way he combines the comic tone with the moral theme. The acerbic satire centres around two of Dickens’s funniest, and most monstrous moral failures: Seth Pecksniff and Sairey Gamp. She is one of his funniest and most famous characters. But there’s a new element here. In addition to his brilliant portrayal of hypocrisy and self-delusion, Dickens shows a concern for the moral development of his characters. 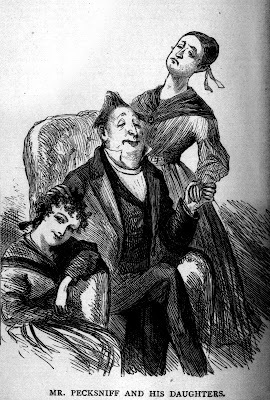 The young nephew Martin Chuzzlewit, Pecksniff’s daughter Mercy, even the stereotypical Dickens-innocent Tom Pinch - they all undergo significant change because of the sufferings and travails they go through. This sort of character development is new for Dickens. It shows a significant move away from a reliance on melodrama or farce, and a more complicated notion of novel structure and the interaction between story and character. With Martin Chuzzlewit, Dickens is back to what he does best, and finding ways to make his stories even more satisfying. This sounds like an excellent novel to read.Your review points out how Dickens combined his own personal concerns, his view of America, money family and so on. I am reading Little Dorit at the moment but Chuzzlewit is a must. Thanks for your great review Clive.